You can set the height/width of rows/columns in a Grid using the Height and Width properties of the RowDefinition and ColumnDefinition elements. You can specify these values in one of three different ways. Below is an example showing these methods to set the width of four columns in a grid. 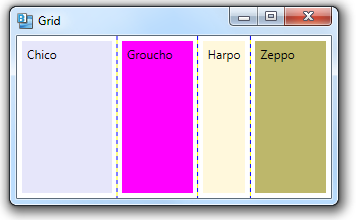 The Chico column is set to 100 units wide, Harpo column set to fit content and all remaining space is split up between the Groucho and Zeppo columns.